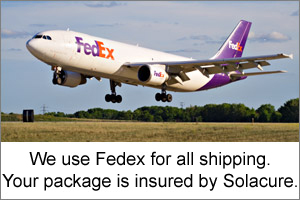 Solacure is a US based company and we ship from our main office in Greensboro, NC. Flower Power lamps will be available throughout Europe via our UK partner, FDP Wholesale. If you live in Canada, Puerto Rico, Alaska or Hawaii, you need to call for rates and/or duties. No FPOs or APOs due to the size of the boxes. We use Fedex Ground for all US shipments, and most Canadian shipments. If you live in Hawaii or Alaska, email us as we can generate a shipping quote and invoice using Pay Pal, making it easier to make payments. We are on Eastern Time, North Carolina. Please note that damage in shipment is rare and our policies are covered on our Warranty page. Shipping times are usually 1 to 2 business days from the date you place your order. Each order must be hand packed, and they are glass, so very special handling and packaging must be used. The prices shown here including handling and 100% insurance (48 states only), so there are no added fees. Insurance is provided by Solacure so damaged shipments should be accepted, and a claim made by calling Solacure directly at 1-800-600-8118. Please note, shipping isn't cheap, we understand this. UPS/FedEx do not charge by the pound on glass tubes, they charge by "dimensional weight", ie: by the cubic foot of box, so a 5 pound box of 4 lamps is charged like it weighs 22 pounds. 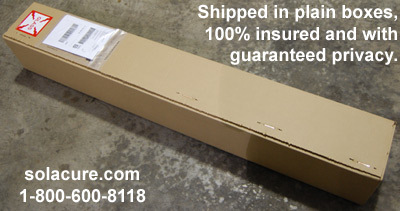 In order to package your lamps safely, it requires larger packaging than you might expect. There isn't anything we can do about that. As soon as your item ships, you will get an email from Fedex, with your tracking info. Since our business is just a few miles from a Fedex hub, our turn around time is fast: 1 to 5 business days nationwide. Call us if there are questions or if you are wanting to buy large quantities, as we give substantial discounts for bulk purchases. This price includes 100% insurance, 30 day "No Light Warranty*",handling and specialized packaging required to safely ship glass tubes. Multiple case purchases will be charged at actual cost of shipping and handling when you call. We've been shipping glass tubes for decades, and know how to do it right. The above price includes 100% insurance and a 30 Day No Light Warranty. Basically, if most anything goes wrong in the first 30 days, we pay for everything: product, shipping, everything. There is zero risk to you. We make buying easy, and take out all the risk. In the rare instance you have a problem, just call us at our main toll-free number, 1-800-600-8118 and we will take care of everything.